Allan is a skilled financial professional with a deep understanding of finance operations and auditing in both the public and private sectors. He is a consensus builder and skilled negotiator with the ability to develop and present complex information and obtain useful feedback to drive business decisions. 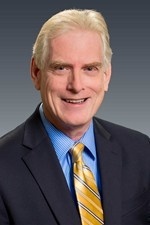 Before joining CFO Selections, Allan served his community while working for state, county, and local government agencies, including five years as Assistant Auditor for the State of Washington. As a consultant in private practice, he was responsible for accounting, finance, forecasting, strategic planning, job costing, deal analysis, negotiation, and financing in client organizations. He trained, supervised, and mentored team members, and oversaw the conversion of several accounting systems, including development of operations policies and procedures to ensure timely and accurate system migration. He began his career in public accounting, working in the tax groups of three public accounting firms. 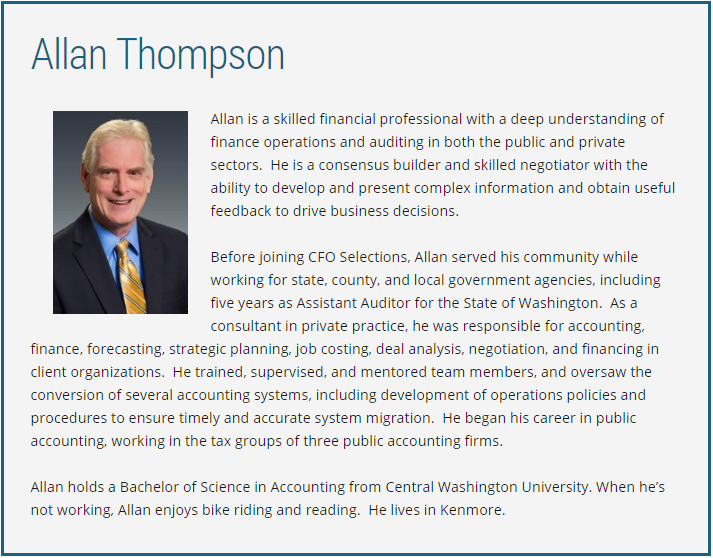 Allan holds a Bachelor of Science in Accounting from Central Washington University. When he’s not working, Allan enjoys bike riding and reading. He lives in Kenmore.